Archive for the ‘scuba course’ Category. Now qualified to provide emergency oxygen to an injured diver, trained to assemble and dismantle the oxygen kit and do a basic check to see that it works. Not a huge amount to this course, and no diving at all, but the safety aspect makes it very worthwhile. It’s also one of the cheaper steps up the 5-specialty course ladder to the rather pointless PADI ‘Master Scuba Diver’ qualification. Equipment: All own gear. Rented steel tank. 24 lb weight (new standard, I think). Had to buy a SMB, spool, compass, and pocket mask, as these were required for the course. The knife finally came in handy, as it was required also. Notes: We did a really great PADI Rescue Diver course at Plunge Diving in Mosman, Sydney. The practical part involved two full days (9am-5pm, pretty much) in the water, and accounts for four open water dives according to PADI, though there’s little extended time under water. It was pretty challenging and by far the best PADI course I’ve done. The best bit of the course was the scenario training- dealing with emergency situations. The instructors mixed it up nicely. We arrived on the wharf after lunch expecting to methodically search an area underwater for a lost diver (a weight belt) only to find three panic-stricken divers on the surface 30 metres away, needing assistance. Later, while assisting a badly bleeding diver back to the wharf, we came across two unconscious divers on the surface requiring safe transit to the nearest beach while receiving rescue breaths. Demanding bastards. The Sunday ended with the ‘I can’t believe this Rescue Diver course is not over!’ game, which involved an astonishing amount lot of rescue breathing, towing, de-equipmenting, dragging and CPR. It took a full day to recover. Can’t fault the course or Ronnie, the instructor. Darn cold at times, in my 5 mm two-piece with no hood. Perhaps some kind of hooded vest would be good… also some thin gloves. Notes: Second dive of PADI nitrox course. See Dive #21 for photos. Notes: This was the first dive on a 4-day, 3-night live abord dive trip to the Great Barrier Reef (GBR). The company was called Taka Dive. I did the PADI nitrox course on this trip, which involved some theory sessions and a test, as well as two dives using Nitrox. This was the first of those Nitrox dives. Dive #20: Flagstaff, Sydney, Australia. 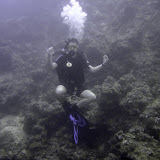 Notes: Advanced PADI course, dive 5/5, “Underwater Naturalist”. Had to spot 5 vertebrates, 5 invertebrates and 2 plants. Average water temperature was 20 degrees celsius. Average depth was 10.9 m. I was very ill with sea sickness for this dive. I only went in because it was the last dive to get the Advanced PADI certificate and it would have been great hassle to repeat it at a later date. I had a headache throughout, even under water.